Power Pack 3 has now been released to Windows Update and can be installed by clicking on the Settings Tab in the Windows Home Server Console, then Update Now. Note: If you installed the beta, you must run the uninstall.cmd first. Your server will reboot when the uninstall is completed and also when PP3 is installed. 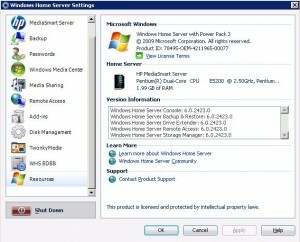 You can check which version of Windows Home Server you are running by clicking on the Settings Tab in the Windows Home Server Console, and clicking on Resources. Our Wiki has details of each release of each of the Windows Home Server build levels if you want to compare. Alex Kuretz is quoted on the Windows Team Blog, “Windows Home Server Power Pack 3 makes storing and accessing your media easier by bringing all the content contained on your Home Server smoothly into your Windows 7 libraries. TV Archive is also a very nice feature that has allowed me to record TV shows and move them to my Home Server to be watched at a later time.” So if you have Windows 7 or a HTPC, PP3 is a very useful update. Microsoft has also released a new version of the Windows Home Server Home Computer Restore CD. The new release is labelled as version 2423 and was posted 23rd November 2009. Although there is no additional information available at this time, we can see that it’s a Dual Boot version similar to what was posted as a public beta in April 2008. The Home Computer Restore CD (Dual Boot) is a new version of the Home Computer Restore CD that provides two options for you, depending on the amount of RAM in the home computer you are trying to restore. Have you installed the update yet? Please share your experiences in our forum. I'm a Technical Architect based in the UK predominantly working on Windows Server and Active Directory based solutions. I'm also a Microsoft Windows Home Server MVP and moderator/author at http://www.mediasmartserver.net. I've released the FirePlay for Windows Home Server, WHS PHP Installer, MySql Installer for WHS and Wordpress Installer for WHS Add-Ins as well as co-author of the SanEncore and WHS Health Add-Ins with Alex Kuretz. I urge anyone who has to restore a Netbook or Nettop Client with an external drive to obtain a copy of the new PC Restore CD. The origional for some reason can cause an issue with the BSOD or Blue Screen of Death as was the case with me with 2 Netbooks. Since I was sending one to China I just ignored the issue but on another one I wanted to add a larger hard drive so the issue could not be ignored. To correct this I found the Duel Boot PC Restore Program which corrected the issue I was having with the BSOD. Better to have it an not need it then to need it and forget where to find it so I urge everyone to download it.